The audience of literate women in Shakespeare's time was not great, but it was large enough to make it worth a printer's time to publish books especially for them: books on cookery, household medicine, religious attitudes, and correct behaviour*. Containing the inward and outward virtues which ought to be in a complete woman; as her skill in physic, cookery, banqueting-stuff, distillation, perfumes, wool, hemp, flax, dairies, brewing, baking, and all other things belonging to a household. A popular work on the education and behaviour of women was Luis Vives*, The Instruction of a Christian Woman (1523). A very fruitful and pleasant book called the Instruction of Christen Women, Which book whoso readeth diligently shall have knowledge of many things, and specially women shall take great pleasure and fruit toward th' increasing of virtue & good manners. Let her learn to hear nothing, nor read, nor speak but that it deal with the fear of God. There is an use nowadays that books written in the mother's tongue be made only for idle men and women to read of war and love. These ungracious books are such as Launcelot du Lac, Pyramus and Thisbe, Arthur and his Round Table, and many other such. A good woman will take no such books in hand, nor defile her mouth with them. Now to which books ought to be read, as the Bible, especially the Gospels, the Epistles, and the Acts of the Apostles, and the Old Testament, the writings of Saint Augustine, Saint Ambrose, Plato, Cicero, Seneca, and much other. Click here for a warning* from Vives against cosmetics. Writers stressed the subordinate position of women, as required in the vision of an ordered universe. Many of the pages dealing with the life of the housewife (social background) quote Markham. Vives (1492-1540) was the most notable of the Spanish humanists. He travelled widely, and spent time in Oxford, where he met the family of Sir Thomas More. He came to England at the request of Catherine of Aragon, to assist in the education of her daughter, Mary. The picture is by the Flemish master Rogier Van der Weyden (c.1400-64), City Painter of Brussels. This is a detail of a larger picture, which itself has been cut from a full painting of the Virgin with Saints. 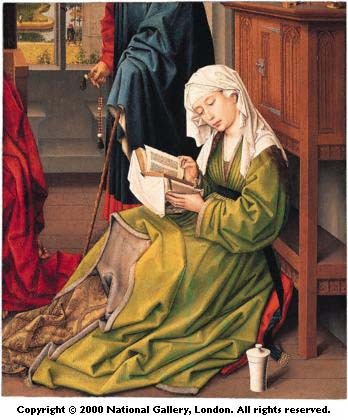 In a manner typical of the Renaissance, the Magdalen is shown in contemporary dress, reading the Bible in a form that would not be invented for fifteen hundred years. The tender skin will wrinkle the more soon, and all the favour of the face waxeth old, and the breath stinketh, and the teeth rusteth, and an evil odour is all the body over, by reason of the ceruse [red lead] and quicksilver [mercury] used. Though his warning is very much in the tradition of male concern with the deception that may be involved in the use of makeup, his warning is actually sound, given the knowledge we now have of the deleterious effect of the metals (mercury, antimony, lead) that were used freely in early cosmetics. I have heard of your paintings, well enough. God hath given you one face, and you make your selves another. . . . To a nunnery go.